What happens to your remote cameras if a rocket launch scrubs? Here, I explain how it all goes down when you’re a photographer and a rocket doesn’t go off on time. Upper level winds too high, wayward boat in the range, helium leaks… you name it rockets get slipped up on them. With as complex as they are, it is a surprise most aren’t delayed more. @Xuan_Thai System was green for launch. I called it off. All was well except for one issue with the TVC (thrust vector control) actuators. Btw, 99% likely to be fine (closed loop TVC wd overcome error), but that 1% chance isn't worth rolling the dice. Better to wait a day. …but out of caution, stood down and scrubbed 24 hours to check things out. Before the first launch attempt as photographers, we get the chance to establish sound-activated cameras on the launch pad. 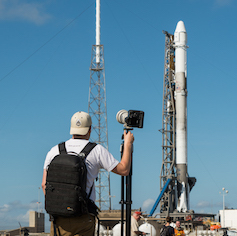 At liftoff, rockets are making one heck of a racket and we use that to set off our cameras. When scrubs like this happen, we usually are given the opportunity to go back out to the launch pad and reset our timers/triggers, replace batteries/memory cards, check framing, etc. This allows us to make sure that everything is as it should be and is ready to photograph the launch. In checking things out at the pad tonight, I was able to transfer several photos that were captured via my time-triggered cameras. Sound triggered cameras only fire with loud noises/liftoff. Time based triggers go no matter what, even if there are scrubs, and usually are best suited for instantaneous launch windows like that of CRS missions to the ISS. The ISS is moving so quickly that there is only a slim (single second) opportunity to launch. If you miss that single second liftoff, you have to delay to the next day or later. Here are two of my remote camera views that I was able to grab tonight. In this view above, the flame trench will guide the exhaust to the right and behind the water tower. I am excited to see what it looks like at launch. My second favorite, taken at the same second is from the 5 o’clock position of the launch pad. This remote is setup with a Canon 40D and a 70-200mm f/2.8L. While the white puffy plume looks like a bad sign, this is entirely nominal. The rocket, as it fills with cold, new liquid oxygen needs to be purged of the LOX that has boiled off and become too warm. This is shown here in the outgassing of LOX before launch. in Lightroom on a sunny day like it was forecast and is forecast to be Sunday as well, is a perfect exposure. One final look at what my view of launch will be again Sunday morning. This is what I saw this morning (saturday) just as the abort was called. Hoping the weather tomorrow turns out similarly and Falcon has a successful launch, landing of the first stage booster, and most importantly – delivery of Dragon to orbit. See you tomorrow for another photo story, hopefully with some sweet launch photos!